Get rid of that old milk crate, get your rods and tackle organized and go catch some fish. The NRS Ambush Tackle Bag gives you the features and functionality you need to stay on top of your game on the water. 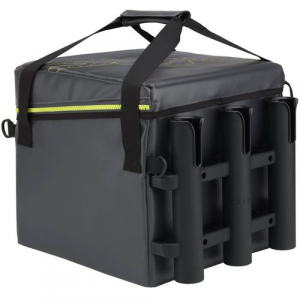 Designed and built to fit perfectly behind the seat of most sit-on-top kayaks, the Ambush is the superior replacement for the standard milk crate. Rugged PVC exterior sheds water and stands up to all the use and abuse you can throw at it. Rigid inserts on the sides hold the bag's shape. Three rigid rod holders keep rods safe and organized while paddling and let you switch easily between rods while fishing. Adjustable dividers let you configure the inner compartment the way you like it. D-rings on each corner make it easy to secure the Ambush on your kayak. A zippered pocket on the front of the bag is a perfect spot to keep your maps, charts, license and catch cards. And we've included a HydroLock Mapcessory Case for small items that need to be kept absolutely dry. A handy carry strap allows for easy transport to and from the water. Heavy-duty YKKA(R) zipper on the top ensures years of easy operation.